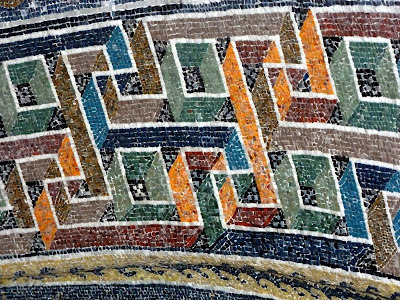 I loved the bright, perfectly preserved mosaics in Ravenna, and decided to research them a bit. In Byzantine times, the greatest gift an emperor could bestow on a dependent town was a few tons of gold, glass and enamel–and an artist. From Justinian’s time, the art became a trademark of Byzantine civilization. As part of diplomatic initiatives, Constantinople’s emperors send their mosaicists abroad–their work can be seen in Egypt, Sicily and in The Great Mosque of Cordoba. Mosaics were a favourite Roman medium before the advent of Christianity, but not always taken seriously, usually reserved for the decoration of villas. 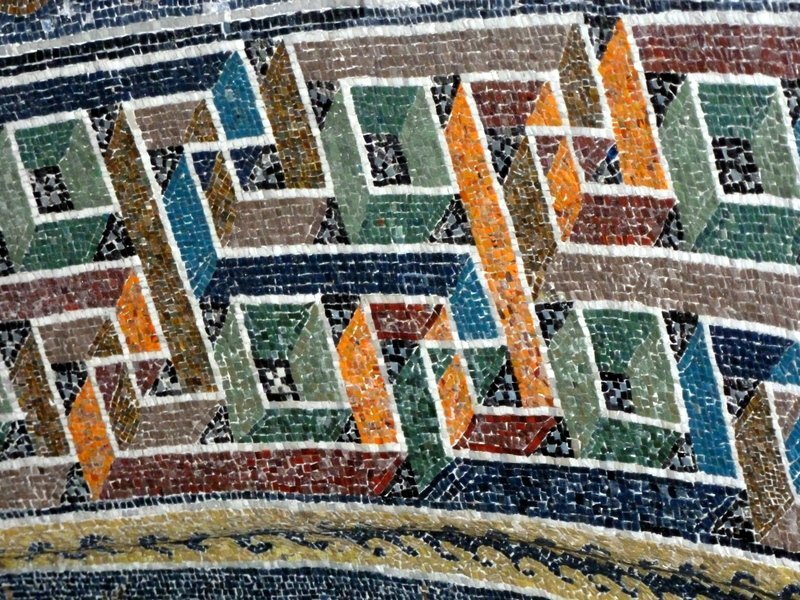 However, early Christians with a desire to build for the ages, and a body of scriptures which could best be interpreted pictorially made mosaics the new medium of public art in the 6th century. Ravenna’s mosaics were probably created by Greek artists from the court of Constantinople. Early Christian art was born here. 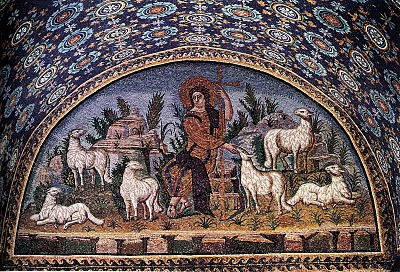 The early mosaicists sought to serve both art and religion. Using a new vocabulary of images (The Good Shepherd, sacrifice) they sought to duplicate and surpass the sense of awe and mystery still half-remembered from the interiors of pagan temples. In churches like San Vitale, with their glorious colours, we still see the same light that enchanted the Byzantine artists–the light of the Gospels, the light from beyond the stars. The Mausoleum of Galla Placida was one of the most magical buildings I saw on this trip. Unimpressive from the outside, but rich and ornate from the inside. The vault shows a deep blue firmament glowing with hundreds of dazzling gold stars set in concentric circles. 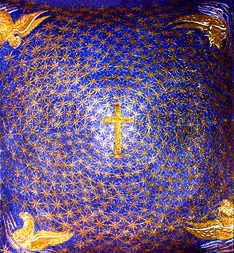 In the centre, at the top of the vault, a cross represents the transcendent God above the heavens. At the corners, are the traditional iconographic symbols of the four evangelists, the lion, ox, angel and eagle. 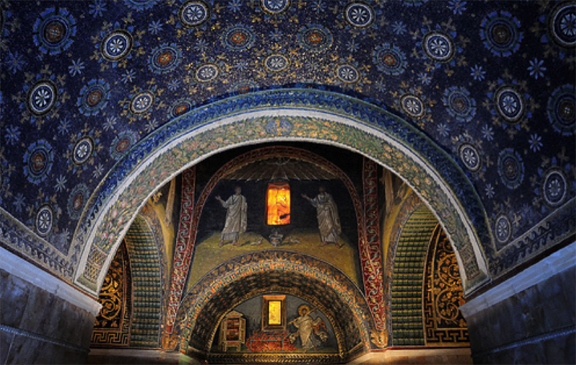 All the Byzantine churches use a similar technique–the small glass tessera are laid in section, alternate rows set at slightly different angels to vary the reflection of light and give an impression of depth. 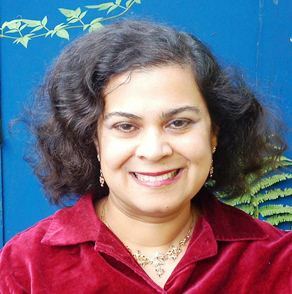 Colour is emblematic, with gold denoting holiness–or high status!! A close up. What bright colours for a 1500 year old mosaic!! Hi Ray, Not familiar with Robert Adam or Osterley and Saltram. Obviously have some googling to do. Perpetua, we spent 4 days in Ravenna and saw all the mosiacs. Ran out of posting steam. Might post some more images and histroy tomorrow. Thanks for these and the previous pictures from Ravenna. Wonderful mosaics also in other buildings like the baptistry and the church of Sant Apollinare Nuovo. It's nearly 20 years since I was in Ravenna (help!) and it's lovely to be reminded how marvellous they are. Stunning! I can only imagine how wonderful they were in person! We really have nothing to compare in this part of the world. Much as I love the work of Robert Adam at Osterley, Saltram and other places the brilliant intensity of colour and design in these mosaics bowles me over.